The stars of the TLC series Seeking Sister Wife Ashley and Dimitri Snowden are expanding their family — but it's not what you think. While some fans are convinced Ashley may be pregnant with another baby, the reality star is actually gaining another sister wife. Yes, Dimitri popped the question (and tied the knot) with girlfriend Vanessa Cobbs. "She said yes!!!!!!" the 38-year-old enthusiastically wrote in an Instagram post. Vanessa was also ecstatic about the proposal, captioning a photo of the couple, "This was a perfect day." 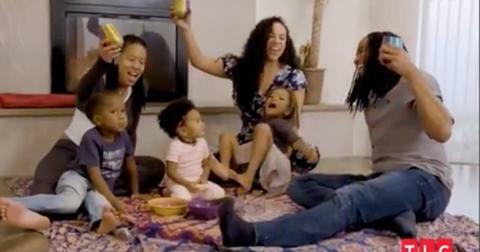 Fans of the show have been glued to their TV screen during Season 2 of the hit reality series. Longtime couple Ashley and Dimitri have been looking to add another wife in their polygamous relationship for a long time — and they finally got their wish. On a recent episode of the TLC show, fans watched as Dimitri prepared for the big day. The reality star and his girlfriend were dating for six months before he popped the question on the beach. Taking his grand announcement one step further, Dimitri asked rapper C-Tru for help in creating a song that could be performed during the proposal. As Dimitri, Ashley, and Vanessa were walking along the beach, the singer/songwriter started performing, which prompted the reality star to start dancing with his lovely bride-to-be. Then, Dimitri dropped down on one knee and uttered, "My sweet love. I don’t have a lot of words to wrap around what I’m feeling, which is why I have these guys to help me. But you’re a wonderful sister wife to Ashley, you’re a wonderful mommy to the children and obviously perfect for me." He continued, "I’m happy that you’re a part of my life and I wanted to make you understand how much I love you. So, with that, will you marry me?" Ashley Snowden officially has a new sister wife. During last Sunday’s special two-hour episode, fans got an inside look into Vanessa and Dimitri’s wedding. However, the big day was not without drama. During the show, Dimitri’s sister ends up walking away angry and upset, exclaiming, "I’m out." And, that’s not all. During a sit-down with Vanessa and Ashley, family members started questioning the sister wives about adding a third wife to the mix. "A third wife sounds great to all of us,” Vanessa said. Ashley added in, "A reason that a third wife functions outside of childbearing is because we are trying to build an empire." Though, their guests did not seem as convinced. “Doesn’t that sounds like a pyramid scheme?" one woman went on to ask. While their wedding may have had some bumps, the thruple eventually made it down the aisle. Dimitri celebrated his nuptials on social media, simply captioning a picture of him and Vanessa, "Starting a new chapter." Not only did he marry wife No. 2, but he also renewed his vows to Ashley during the same ceremony. Congrats to the happy thruple! Catch new episodes of Seeking Sister Wife on Sundays at 9 p.m. EST on TLC.